The "Take it!" Came from a casual glace to my left while stopped for a traffic signal just after navigating through the very peak of rush hour* traffic. 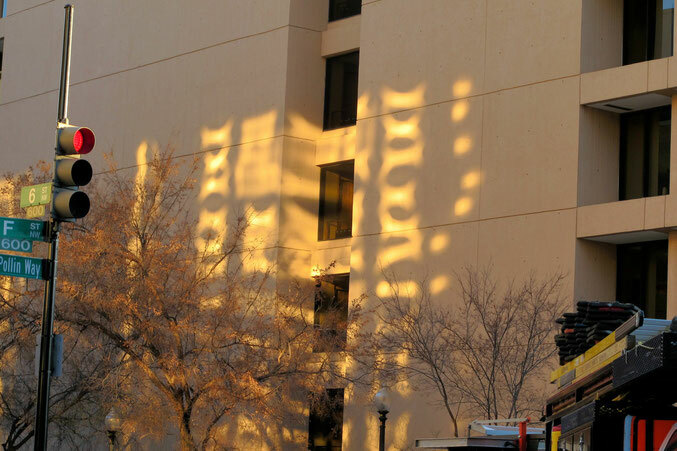 I was given a full sun force reflection of one building upon another. 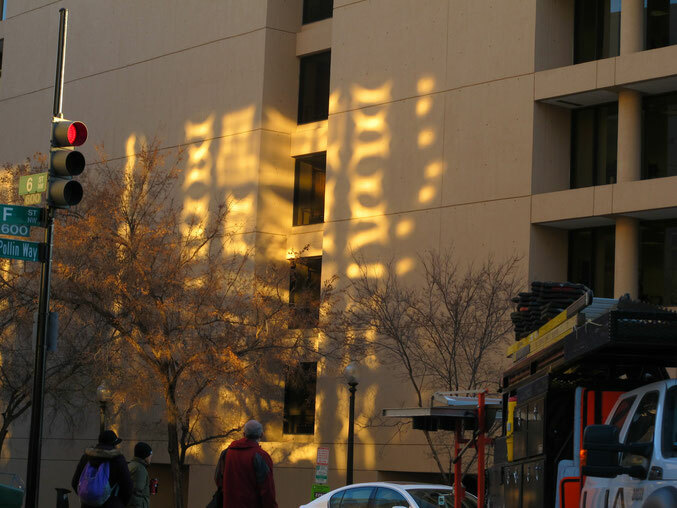 The reflection came from the building being hit with the sun having very large windows which in turn kick off that wonderful light at this time upon the building across the street. Sometimes this type of reflection hits a blank wall which is its own type of show, and then there are other circumstances where the reflected light from windows hits other windows. I enjoy both views, but am especially intrigued with the window on window placement. I look to see if there is yet another reflective projection from this combination, but have yet to find one. It could well be that it is just a single touch situation. My imagination is such that I sometimes impose the wonder of what would an inanimate object say if it could speak. These wondering's include what would it be saying to me. It also includes the question of what would it be saying to another inanimate object. In this case - it would almost be like two buildings getting together each day when the sun shines for a visit. A sort of get very close to talk over whatever buildings have to chat about - things like: the condition of the neighborhood, the way they are treated by the people that occupy them. a recent fire or other incident that happened to themselves or to another building, a new tenant, an air conditioning unit that is getting old and giving them aches and pains - lol - Well, you get the idea - lol. The After Take: Everyone that has seen this photo likes it. I think one of the biggest attractions about it - is the utter randomness of my having caught it. It is the sort of thing that is a form of art by nature that has as its subjects what is man made. A still life taking in the atmosphere in which it has been set up. Here is the hope you happen upon a side long glance, and see something that catches your eye and brings you to a visit with a window. I know the term is "rush hour" but for many of us, it is more like, "Rush Hours." PS: I placed the cropped photo as the introductory photo featured on the top of this narrative for attempted to give it a more " art " like presentation. The photo below is the original which has all the noise of the street below included, which some might consider to be a distraction, while others insist be included, for it provides richer context. This is the dilemma I sometimes face when editing my photos. I gratefully can say many of my photos are straight away copies of how it filled the frame via my camera. I like the crop job. It did improve the overall picture quality IMO. It looks like a bunch of X's. LOL Sf1967 Ya that office window or whatever it is would really need some blinds or something.